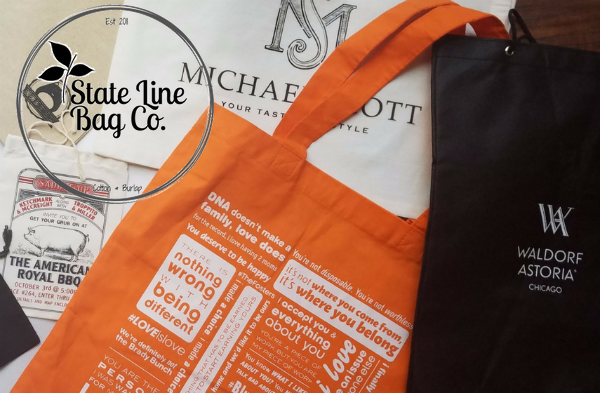 State Line Bag Company is your number one source for custom cotton tote bags and personalized tote bags. With over 1 million bags in stock, and a team ready to help with all your specific cotton totes & tote bag printing needs - we are an excellent choice for high quality personalized tote bags at very affordable prices! State Line Bag Company appreciates all of our customers that return as repeat customers over and over again. We know that our customers keep coming back because we offer quality cotton tote bags, excellent customer service and top notch personalized tote bags made custom for your needs. Individuals and organizations that are seeking a top notch provider of custom tote bags need to look no further than State Line Bag Company. The quality is unparalleled, the customer service is outstanding and the turnaround time is absolutely phenomenal. There is a reason we have been around for so long and have no plans of going any where, and that is because we know that our customers are the reason our custom cotton tote bags continue to sell; and we know they come back because of the quality but also because of the service and experience! We are happy to print your custom tote bags according to your specific needs. We understand that each order is different, and strive to make sure that all quality precautions are taken on each and every order. The personal touch of our experienced printers is evident in our sample pictures, but can't truly be appreciated until you receive your first personalized tote bag order! Contact us for a free custom cotton tote bag quote today so we can evaluate your unique needs and offer a fast quote and realistic shipping turnaround quote. Our Custom tote bags and personalized tote bags come in premium fabric (not available in economy style) and are a 15" by 16" blank canvas ready for your personalization. These are made of high quality muslin cotton fabric. Below are some samples of our past custom tote bags and personalized tote bags.